The tourism agency Welcome to Yorkshire was left with losses of over £1m from the Tour de France. There has been a tourism boom in Yorkshire since last year's Grand Départ of the Tour de France. Figures from Visit England show visitor spend is up by 45% while businesses have also reported a big increase in bookings since last summer. 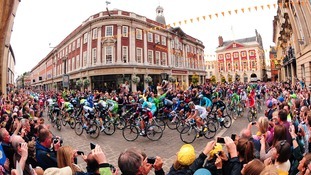 The weekend of the Tour de France Grand Depart generated £8.3 million for the York economy last year, according to a recent report. The report details the economic benefits York has seen and will continue to see in the coming years from hosting the 2014 Tour. It will be discussed later today in a council meeting of the city's Cabinet. An estimated 200,000 spectators lined the route through York. Yellow bikes appeared across the main stages in the Yorkshire Dales, Harrogate and York. Bookings for camping and caravan sites across Yorkshire tripled as a result of this year's Tour de France. A report released today showed the event generated £102 million for the county's economy. We’re absolutely delighted the event brought so much money to the county to help businesses big and small, and there are benefits for the county which are impossible to measure - the profile of Yorkshire around the world has never been higher and this will have a lasting impact on visitor numbers and businesses for years and years to come. The three opening stages of the 2014 Tour de France confirmed the UK’s reputation for staging world-class sporting events with a world-class level of organisational flair. It was a great privilege to have been part of it. The three UK stages set a new standard not just in terms of the amazing support but also because it inspired so many people, young and old, to get on their bikes. A report out today shows that le Grand Départ generated over £100 million for Yorkshire's economy. A report out today on the economic and social impact of this summer's Tour De France's Grand Depart , which started in Leeds and went through West, North and South Yorkshire over two days, will reveal that it produced a £102 million boost for Yorkshire. Around two and half million spectators lined the route over the first two days. With Gateshead hoping to host a stage of the Tour de France, users of the ITV Tyne Tees Facebook page have been suggesting possible routes. Plans for Gateshead to host a stage of the Tour de France may not be just a pipe dream, as British Cycling have joined the debate. They say the North East has strong ferry connections which would be "amazing" for cyclists taking part in the Tour de France. Andy Cosgrove, British Cycling’s regional events officer for the North East, said participation for cycling in the region had doubled at some of its road races and there would be great support from local people. “It would be absolutely fantastic for the North East to host it, there’s no doubt about it, and I’m sure the North East public, just like they do with the Great North Run, would support the event amazingly. The world’s greatest cyclists could one day race through the streets of Gateshead as the council float plans to host a stage of Le Tour de France. “I’m particularly keen that we get to host European Athletics and events like the Tour de France and the Commonwealth Games are very worthwhile.